Fun, easy, and delicious. Use any variation of fruit - and drizzle with chocolate sauce. 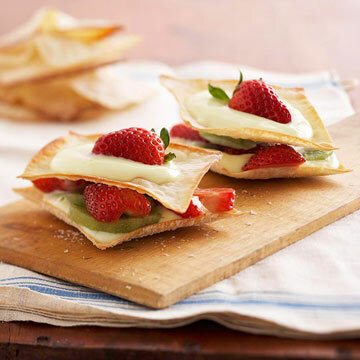 Dovetailing Tip: Use up the leftover wontons and any leftover fruit from the week on these fun desserts. Preheat oven to 350 degrees F. Line a large baking sheet with parchment paper; lightly coat with cooking spray. Place wontons flat on the baking sheet; lightly coat with additional cooking spray. Sprinkle lightly with sugar. Bake for 6 to 8 minutes or until golden brown and crisp. Remove from oven; cool slightly. Meanwhile, in a medium bowl combine the 1/2 cup sliced strawberries and the kiwi fruit. To assemble, place 1 baked wonton wrapper on each of 4 dessert plates. Top each with some of the yogurt. Divide the fruit mixture evenly among the stacks. Add another baked wonton. Top with remaining yogurt. Garnish each stack with a strawberry half.